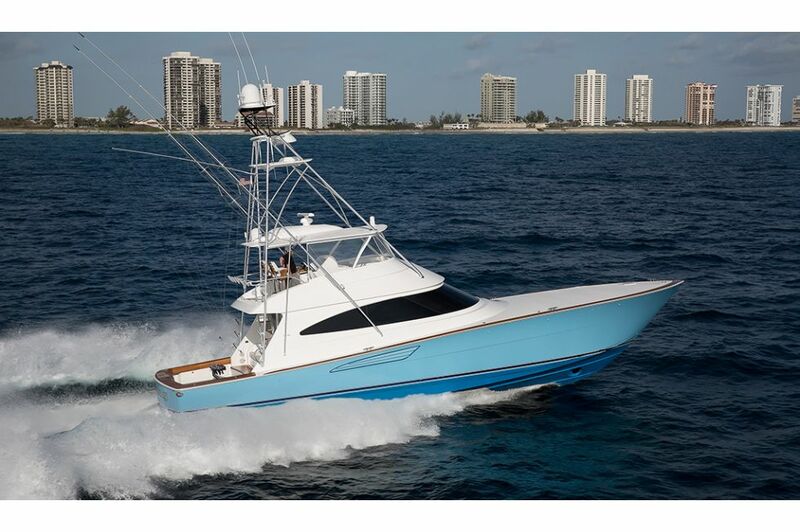 (Fall 2017, New Gretna, New Jersey): Viking continues its dominance of the sportfishing yacht industry with the introduction of the Viking 68, a four-stateroom blue-water convertible with unmatched performance, bulletproof construction, luxury interior accommodations and advanced propulsion and boat-control technologies. 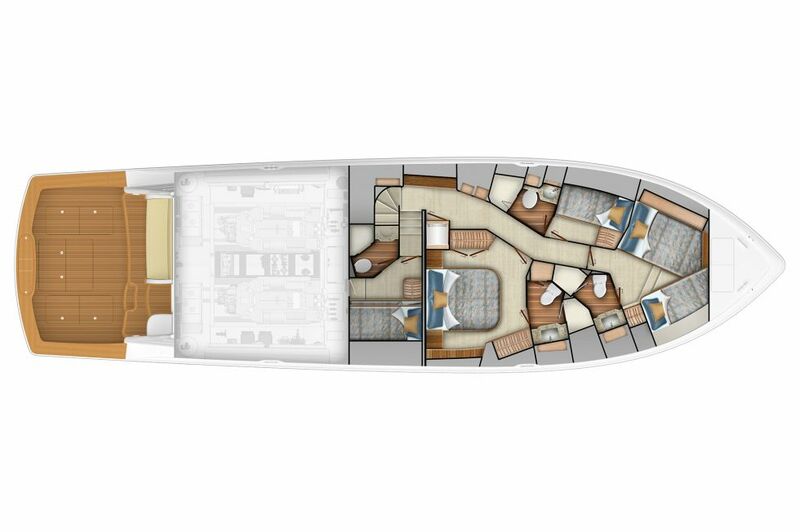 The 68 C is designed and engineered to function equally as well as a tournament-ready offshore runner and a cruising yacht with all the conveniences and technology that you’ve come to expect from Viking. 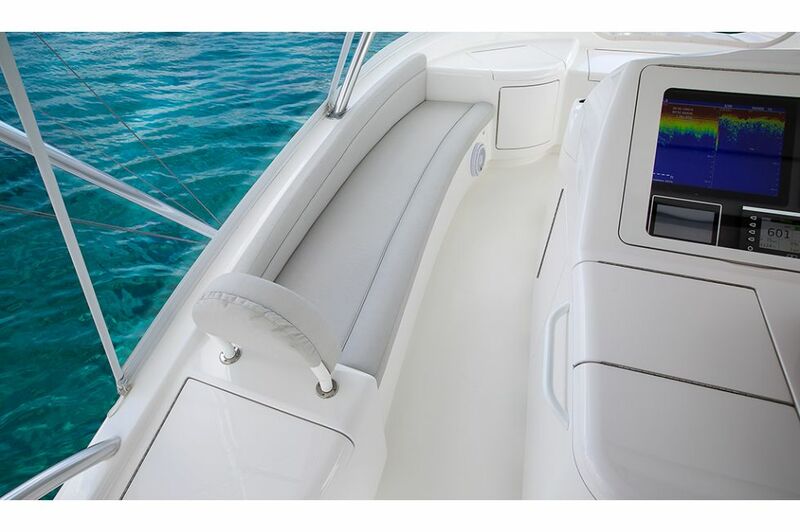 The optional Seakeeper gyro stabilizer heightens the level of comfort during both fishing and cruising activities. Anglers do battle in a 176-square foot cockpit, while guests can watch from an air-conditioned observation mezzanine. 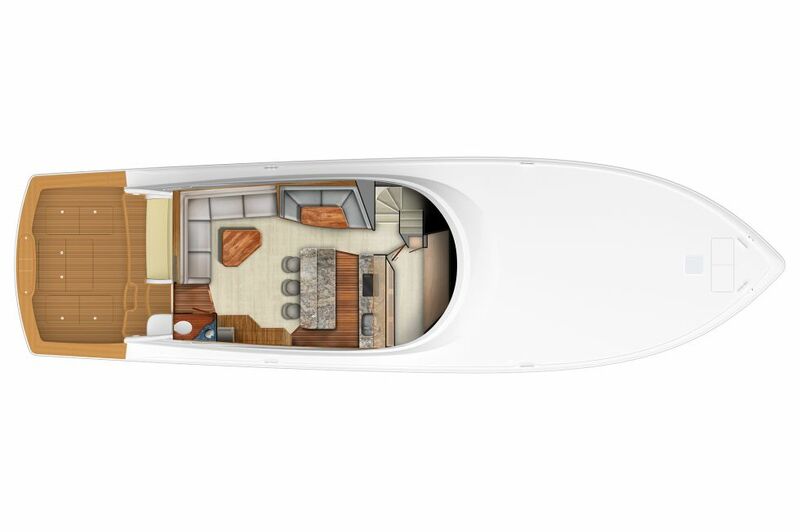 Running on Viking’s proven hull shape with a 12.1-degree transom deadrise, this beautiful battlewagon delivers a soft ride in rough seas, with a 35-knot cruising speed and a top end approaching 40-plus knots. 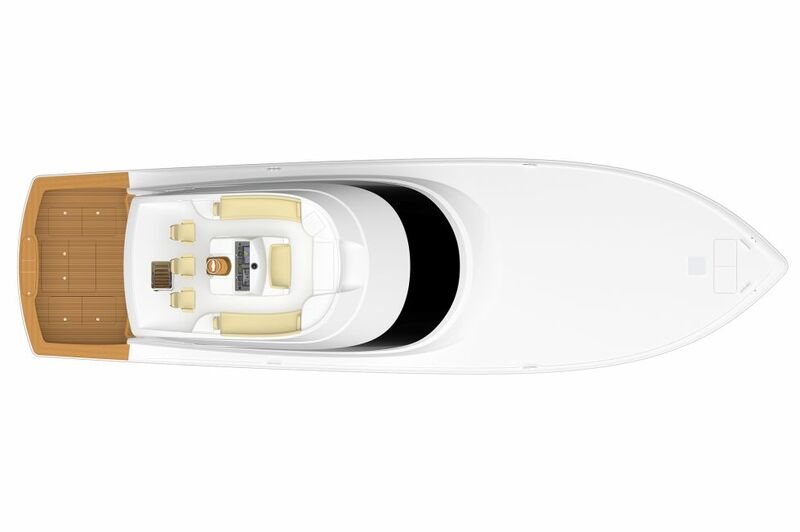 An aggressively raked stem, gently sloping sheer, swept-back black-masked windshield and flying bridge brow present a powerful yet elegant picture. 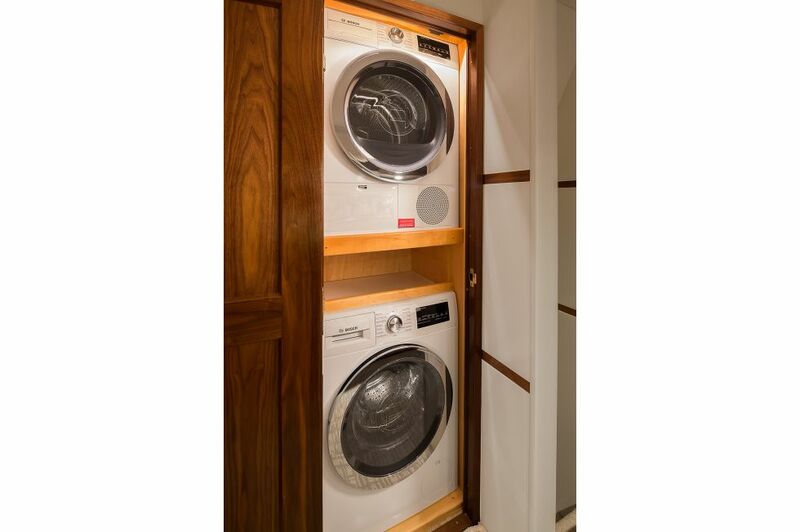 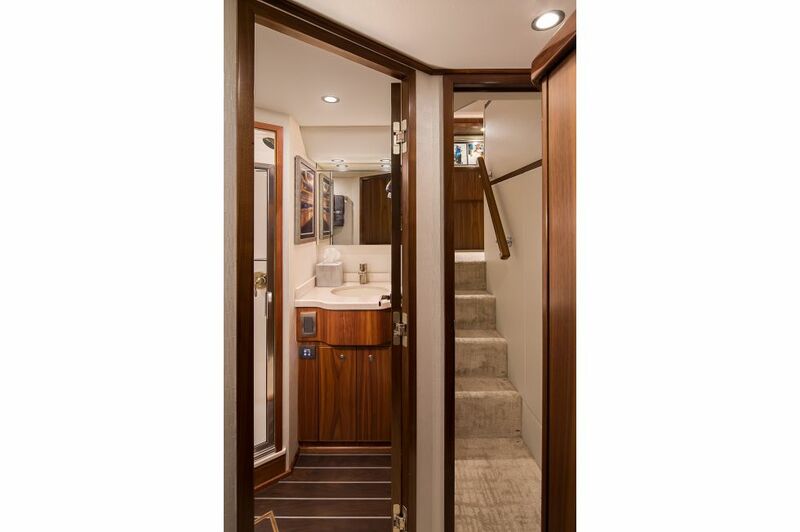 Step inside the deckhouse and enter a world of luxury, comfort, convenience and smart storage solutions. 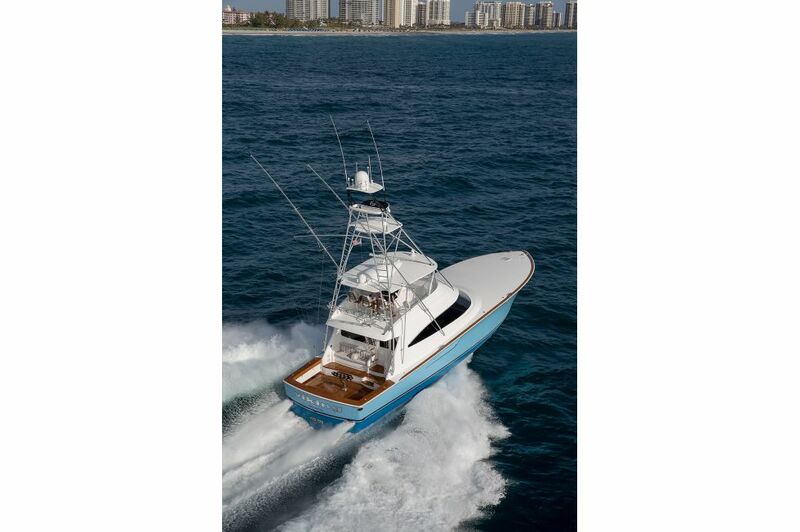 The four-stateroom, four-head arrangement is sure to please the most fastidious yachtsman as well as the most particular tournament fishermen. 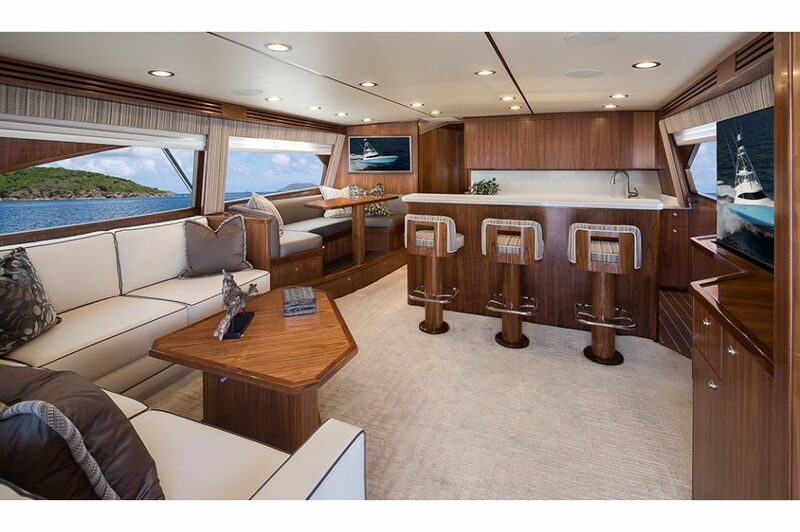 A high-gloss walnut finish decorates the entire interior, and the salon is a blueprint of intelligent form and function, utilizing the wide beam to its maximum potential. 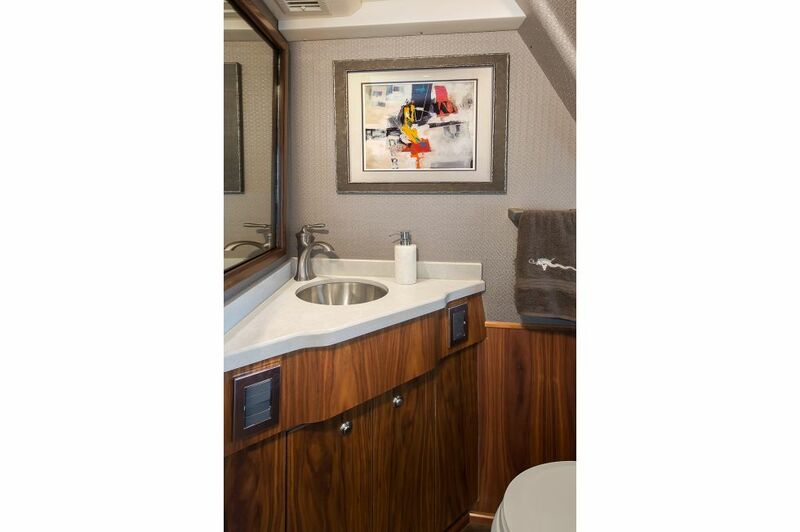 From the electrically operated salon door to the pop-up 49-inch HD TV to the day head with cockpit access to the engineered-stone countertops in the galley, the 68 Convertible flows with luxury conveniences and amenities for comfortable onboard livability. 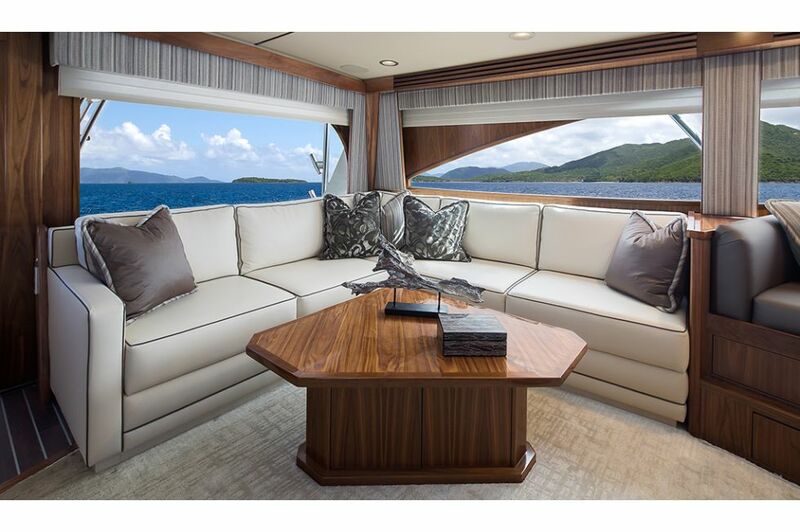 Frameless windows fill the spacious salon with an abundance of natural lighting. 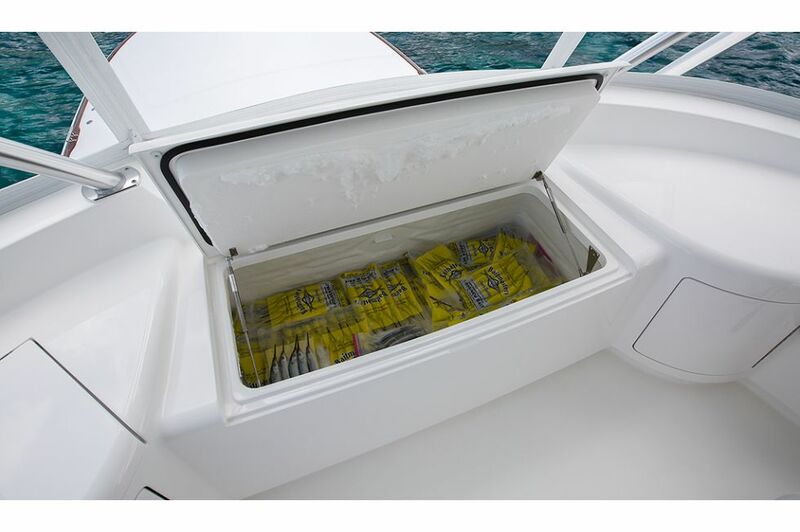 Air conditioning flows from hidden registers behind valances to better distribute cooling air and reduce noise. 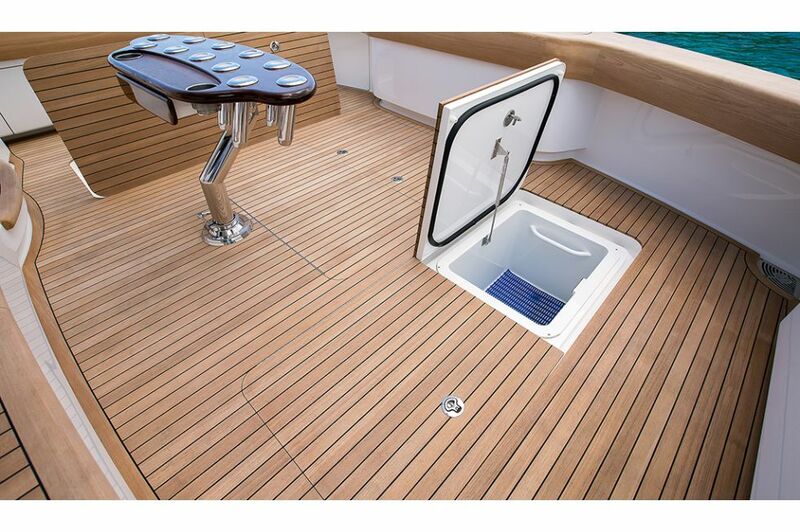 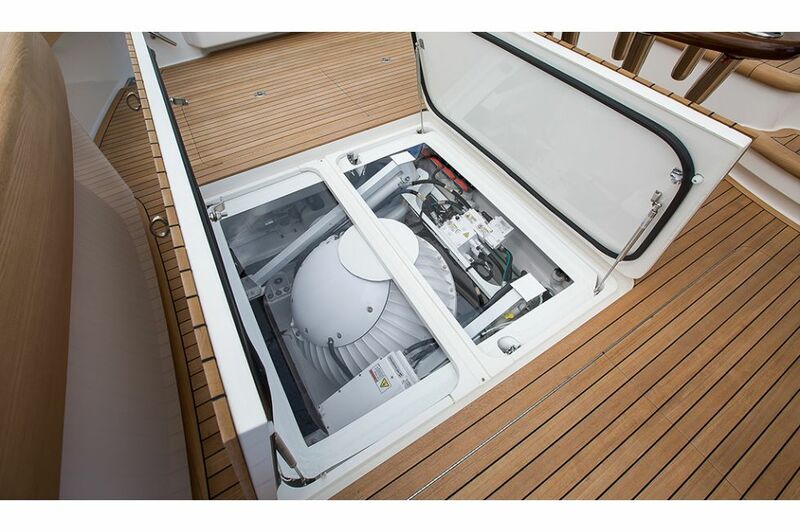 We’ve placed the electrical panel directly inside the companionway door at eye level for quick access and operation. 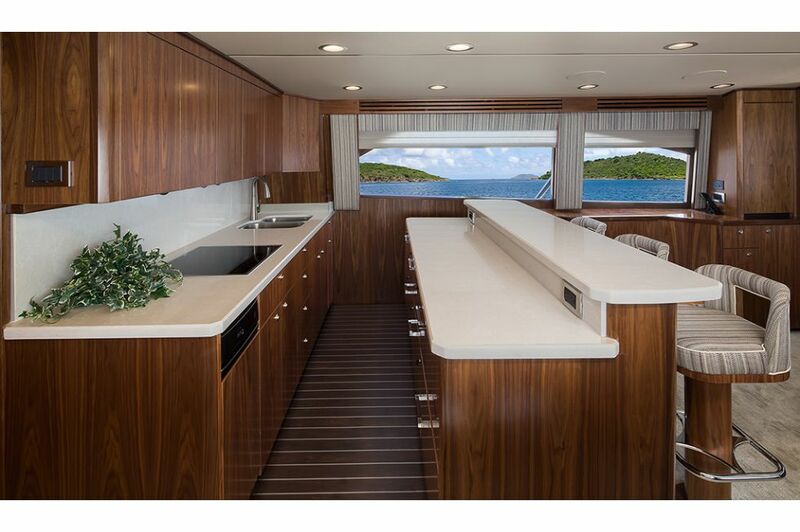 Open to the salon, the 68 C’s walk-around island galley maximizes space while serving as a prime socializing area that’s loaded with modern conveniences, including Sub-Zero under- counter refrigeration, and pull-out drawers on aircraft-type slide mechanisms that lock in place for safe keeping. 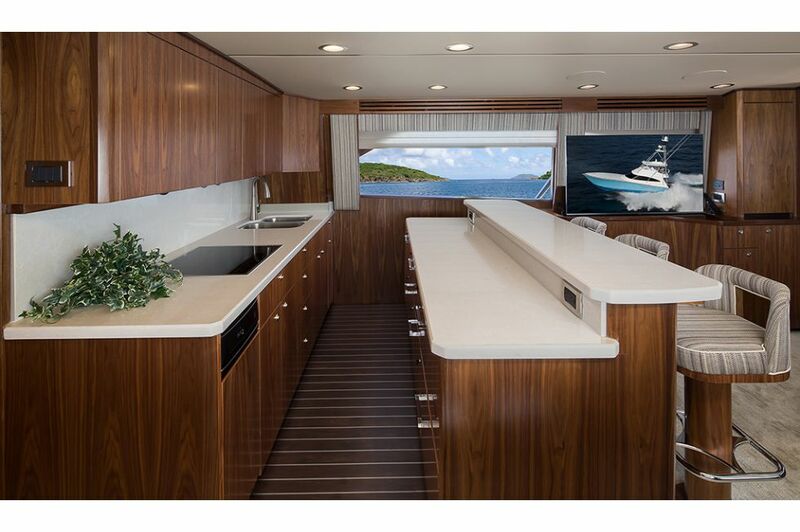 Opposite the galley, a large dinette easily accommodates four adults for dinner and additional bar-stool seating is available at the island galley counter. 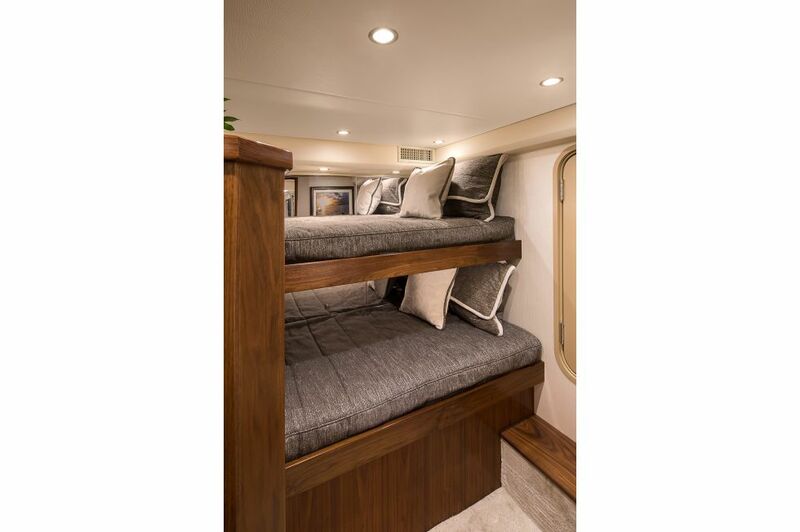 With a layout that puts the companionway to port, the starboard master stateroom “is nearly the full beam of the boat, which means you have the space for convenient storage areas such as his-and-her hanging lockers and credenzas,” says David. 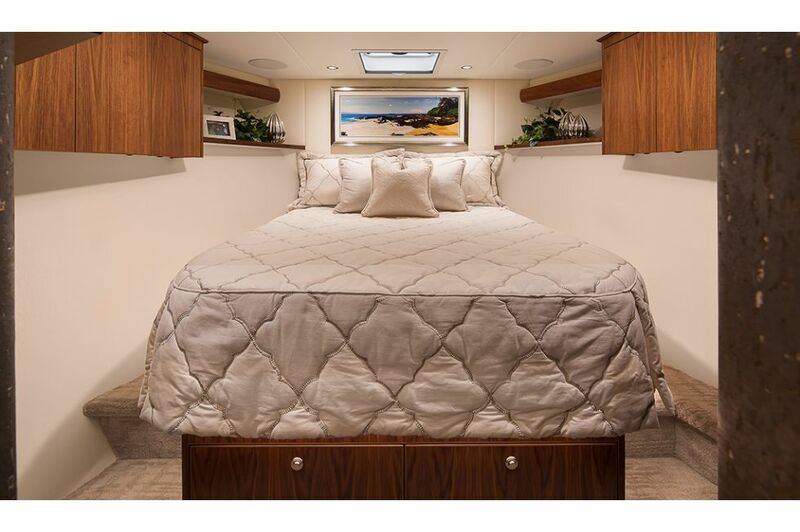 “This is a convenience that’s a difference-maker, one that owners love.” The master includes a queen-size walkaround bed a maple-lined hanging closet with walnut doors, 32-inch HD TV and ensuite head with separate shower. 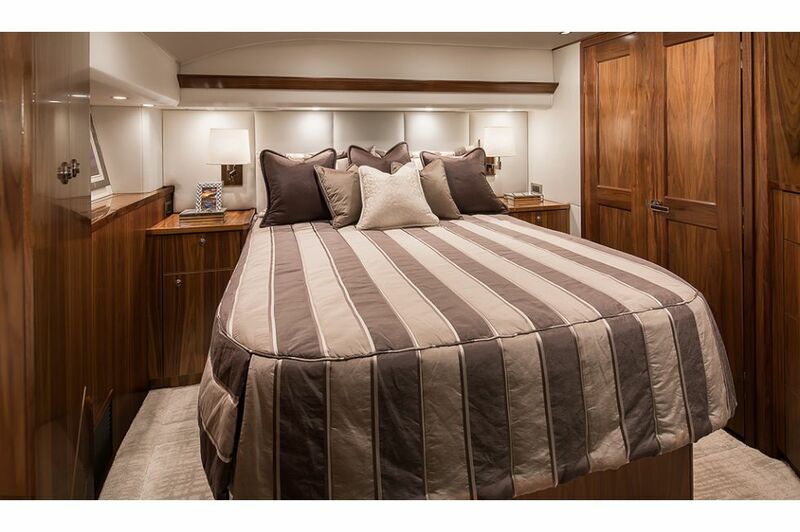 The forward stateroom has a walkaround queen size bed that lifts to reveal a cavernous stowage compartment below. 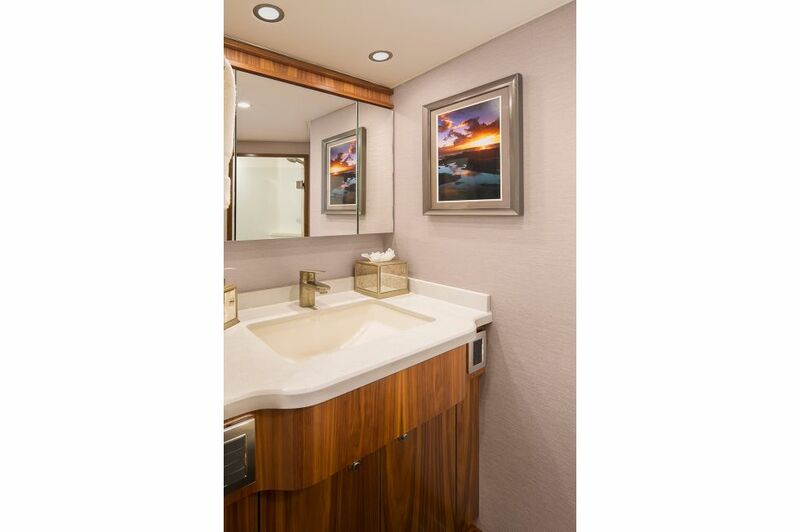 The starboard and crew staterooms feature upper and lower berths and each is served with a private head and stall shower. 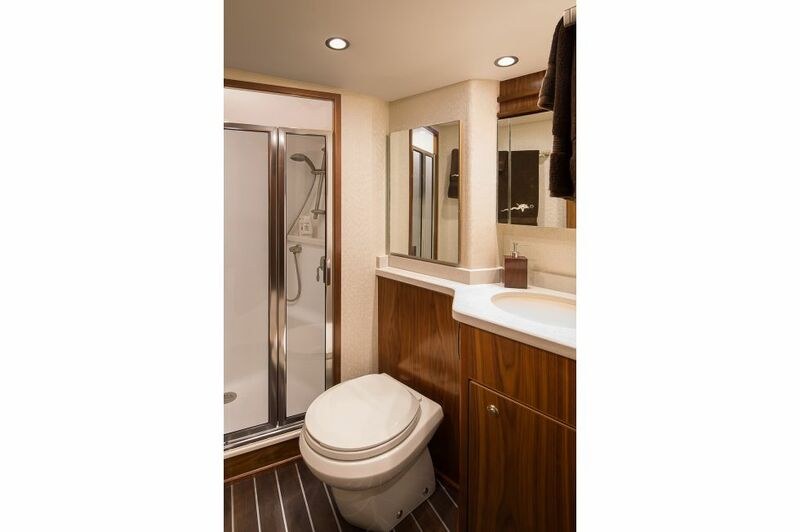 The crew quarters are discretely located, accessed via a separate set of steps off the companionway. 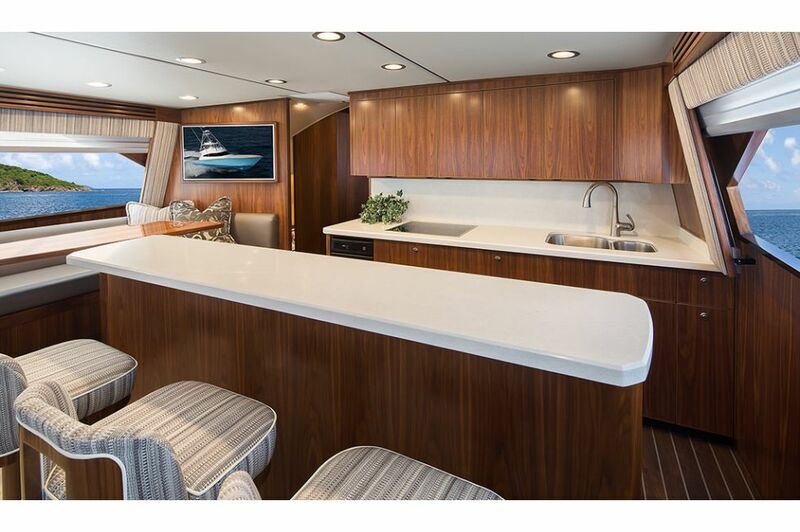 Observation mezzanine with port aft facing lounge seating with Sunbrella-covered cushions, hinged seats, tackle cabinet with pullout drawers and bait freezer. 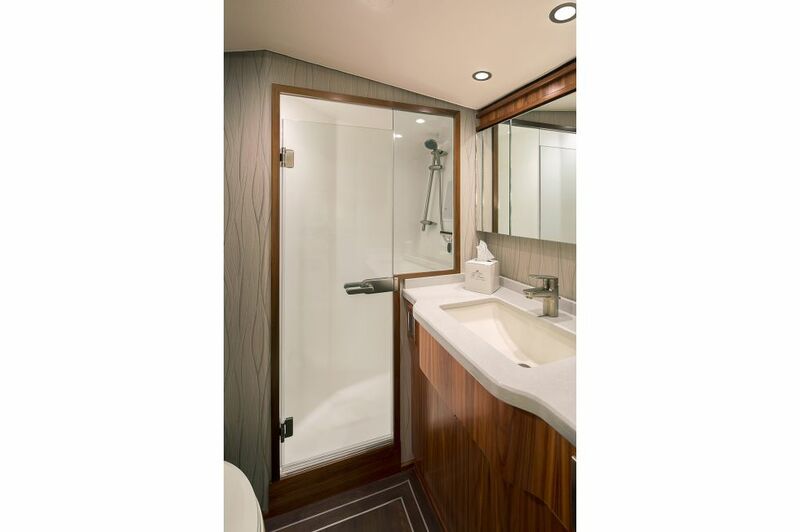 Standard amenities in the cockpit also include a one-piece anodized aluminum ladder to the bridge, rounded coamings, recessed stainless-steel hardware, a stereo and speakers, a large lazarette hatch, fresh and saltwater washdown systems, a refrigerated chill box in the salon entrance step so you can stay close to the action throughout the day, a walk-through transom door with lift gate, a molded nonslip fiberglass sole with aluminum plate reinforcement for fighting chair placement, flush rod holders, tackle and gaff stowage, in-deck fishwell with a macerator pump discharge and stowage compartments for gear and an available circulating livewell. 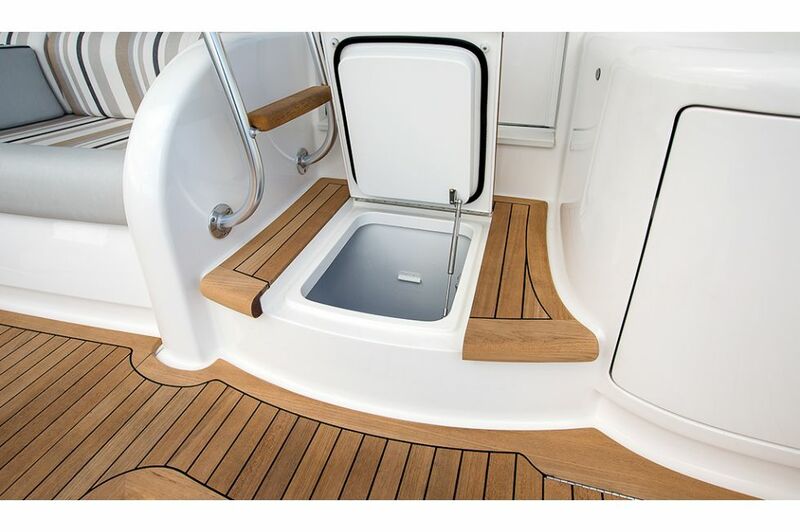 For dockside versatility, port and starboard Glendinning Cablemaster shore power cords are provided. 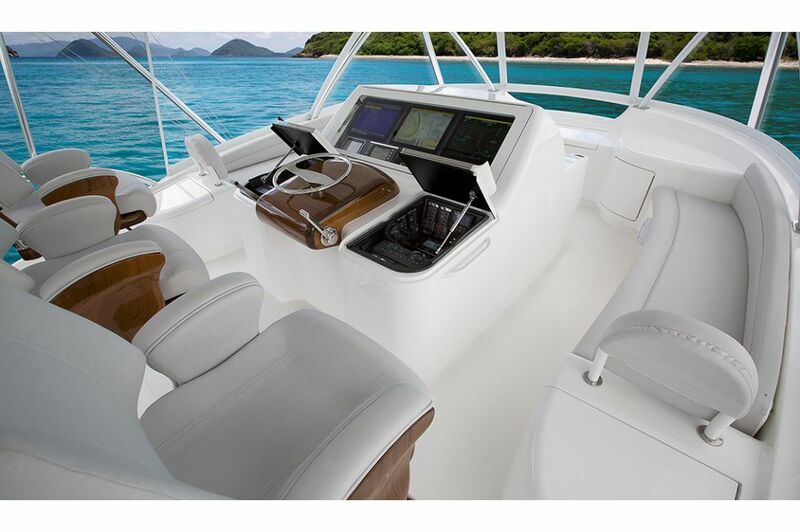 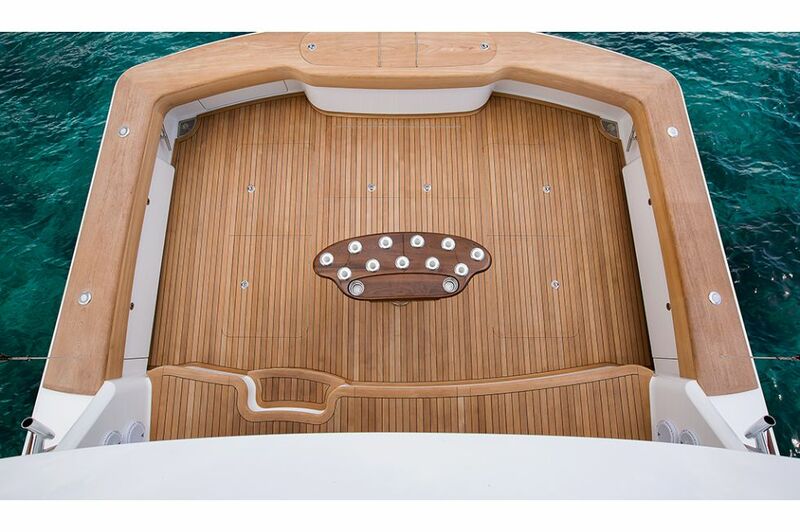 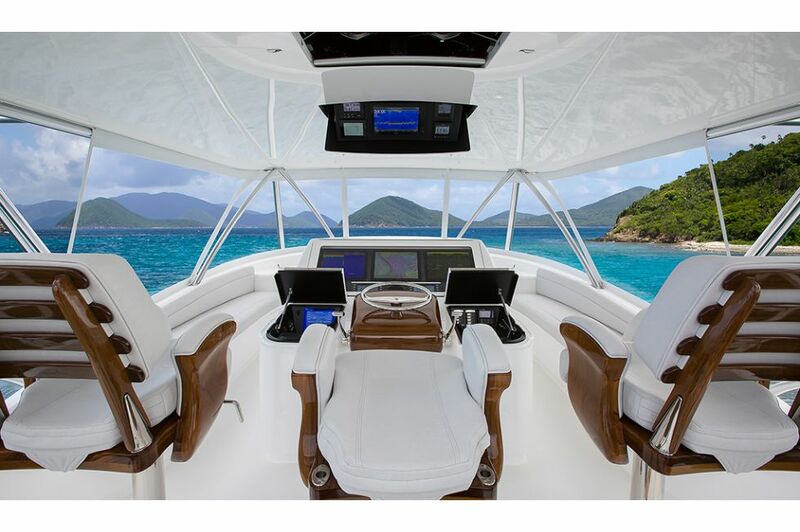 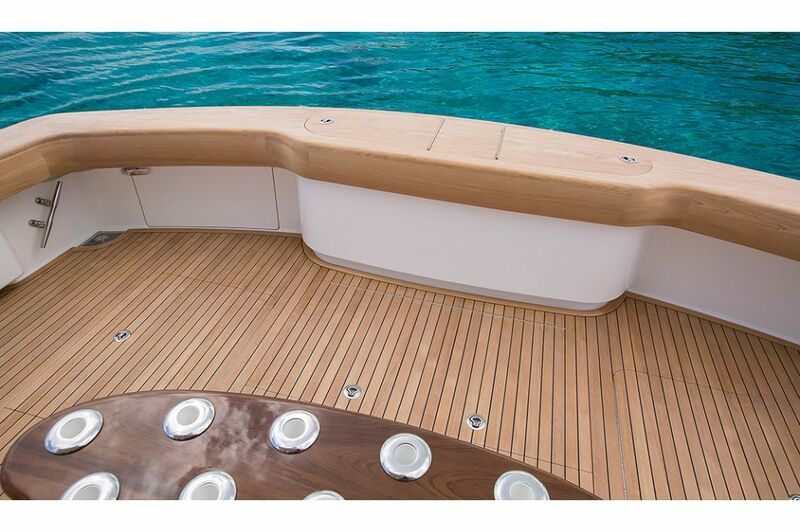 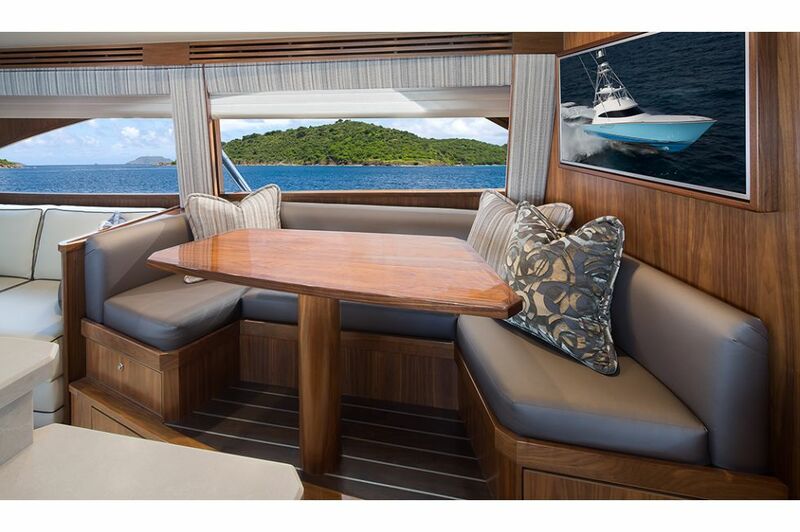 The flying bridge sports a center console helm providing superb visibility to all quarters. 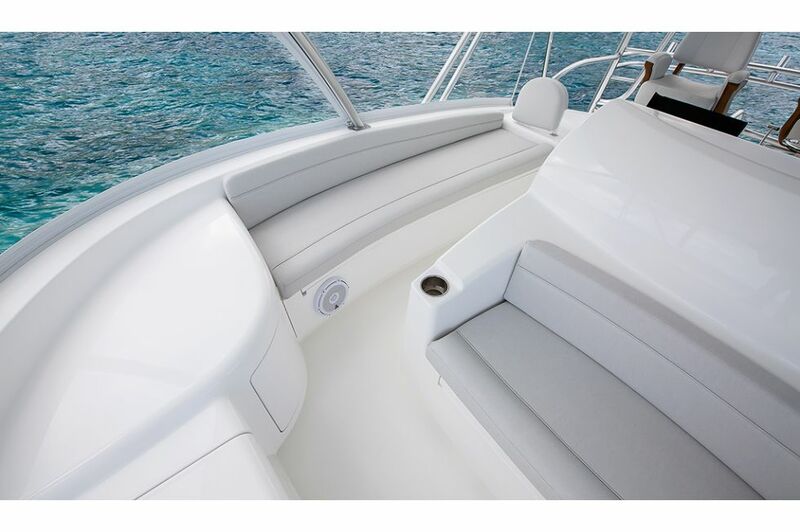 Electronic trolling valves allow maximum control on the trolling grounds. 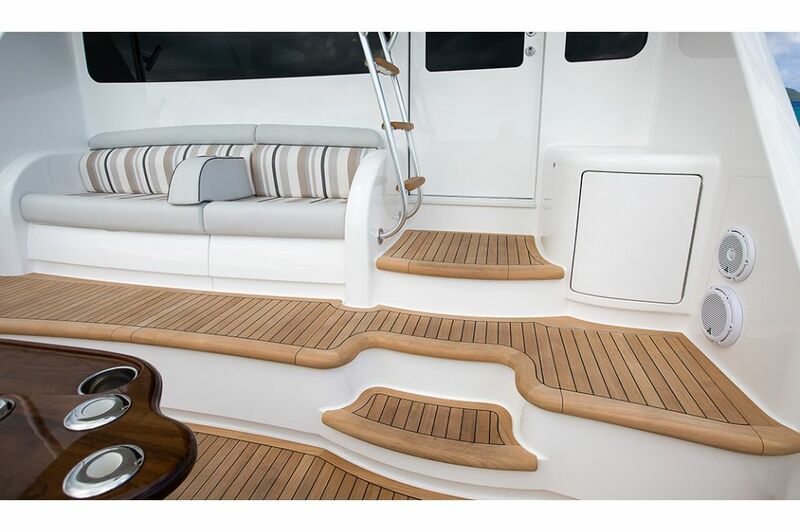 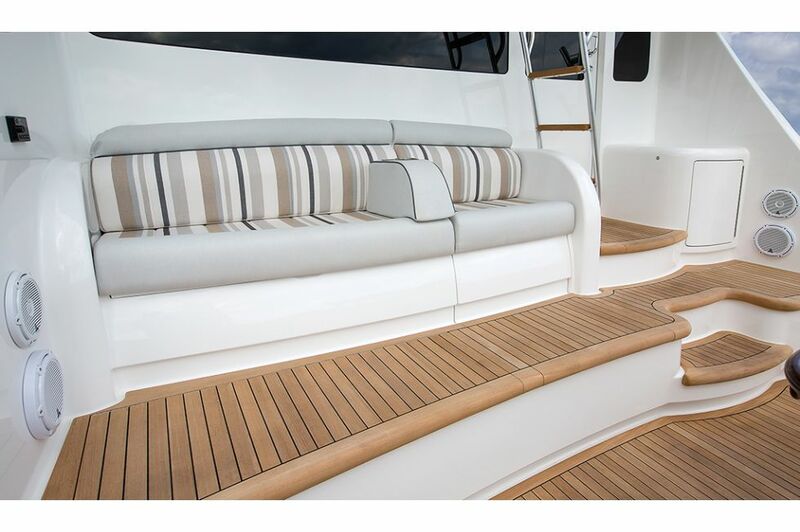 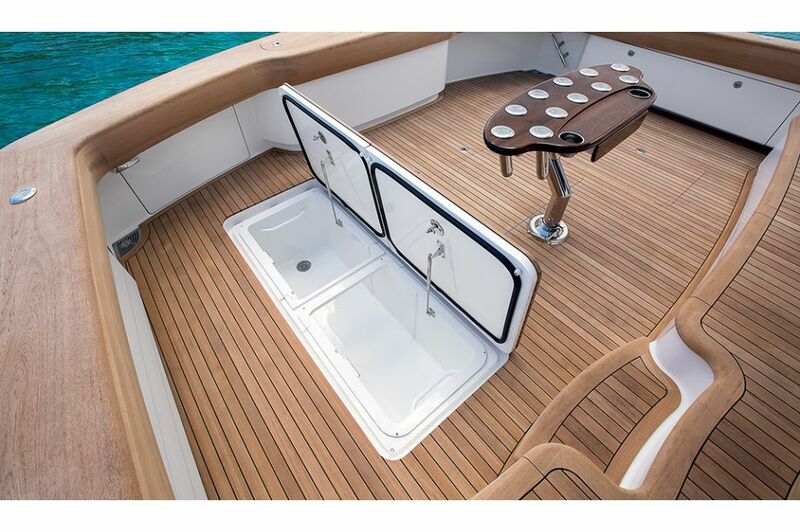 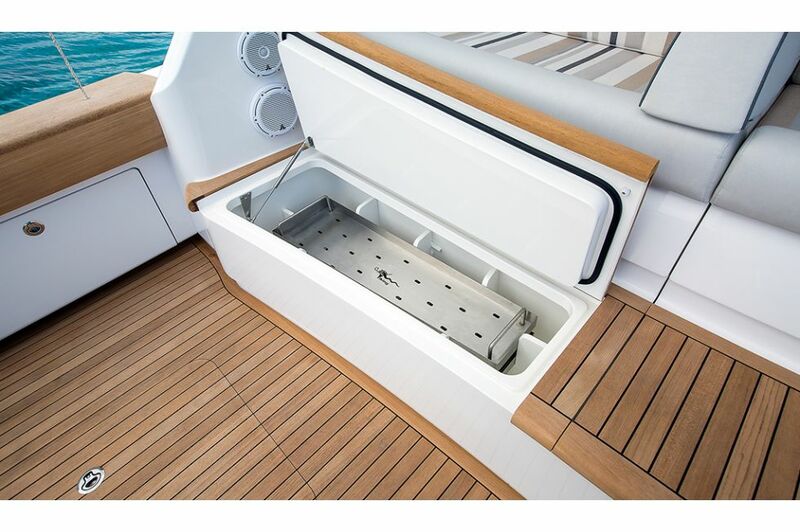 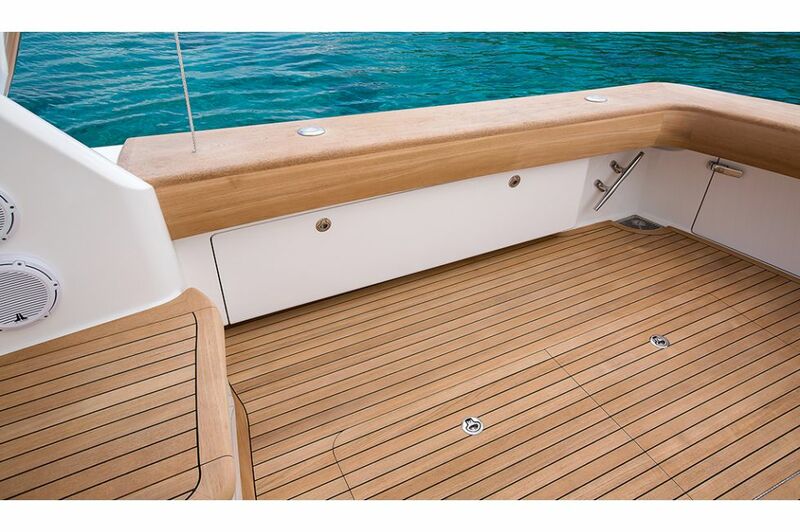 Fishing rods stow neatly under port and starboard bench seats, while electronics nest safely beneath a clear acrylic panel on centerline, which keeps them dry in any weather yet always within easy view. 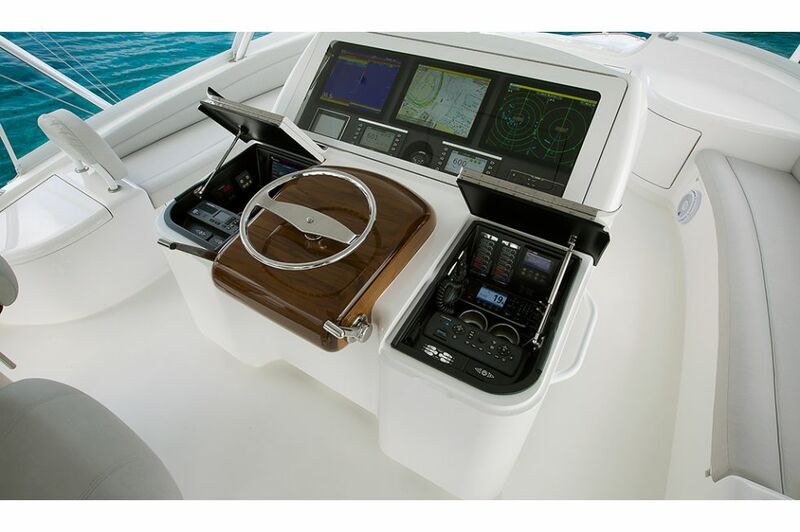 Forward of the helm is an additional freezer and bench seat. 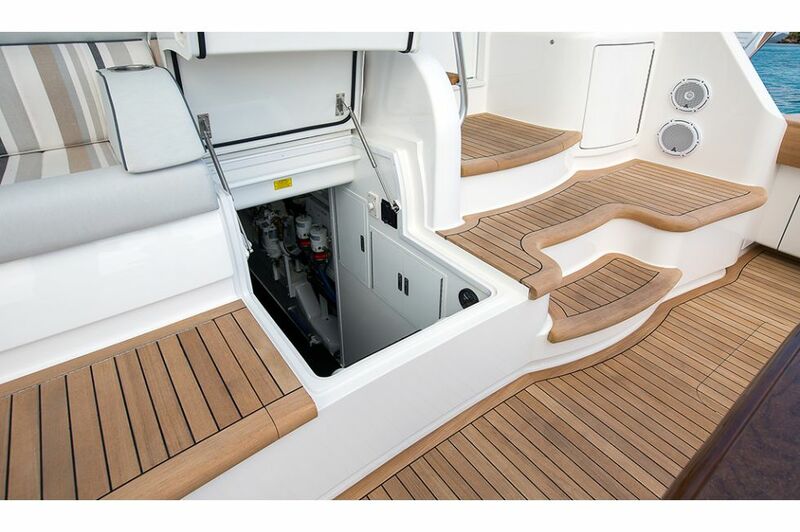 While this proven arrangement is a favorite with tournament fishermen, a climate controlled enclosed bridge with a spiral staircase from the salon also is available, a popular plan with cruising yachtsmen. 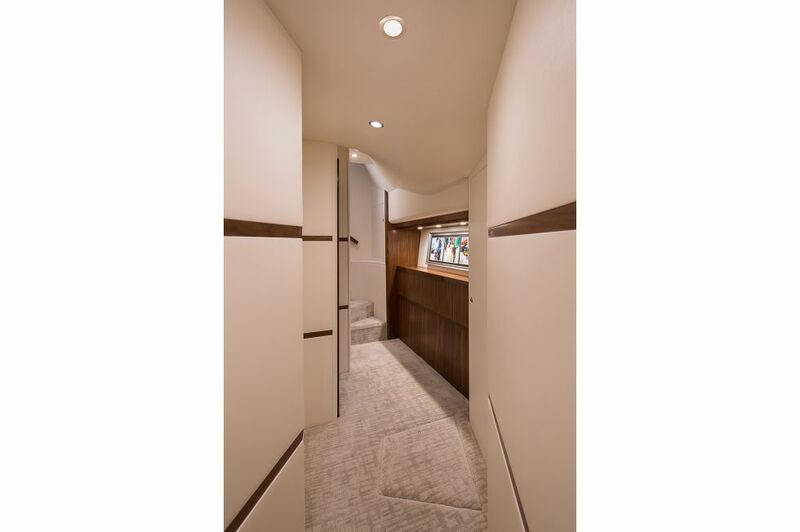 In addition to providing comfort and convenience, the enclosed bridge serves a second salon and private retreat. 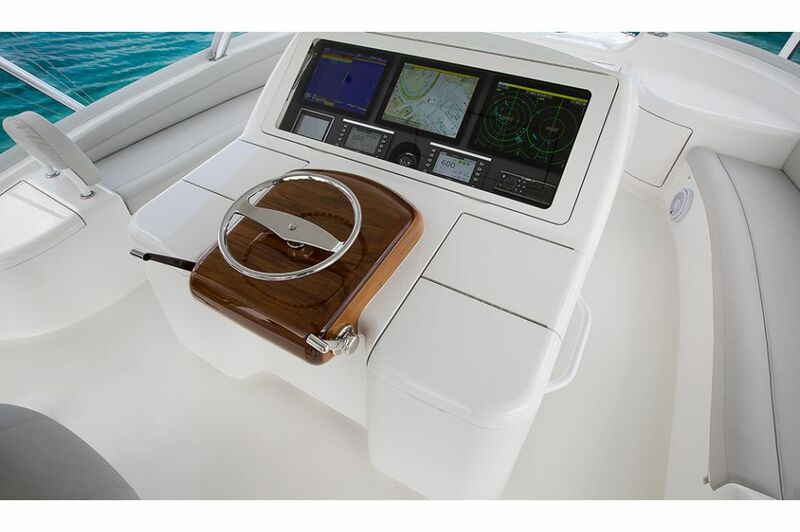 The forward control station has all the necessary control switches, lighted instrument and engines controls along with VIPER (Viking Independent Programmable Electro-hydraulic Rudder) steering system. 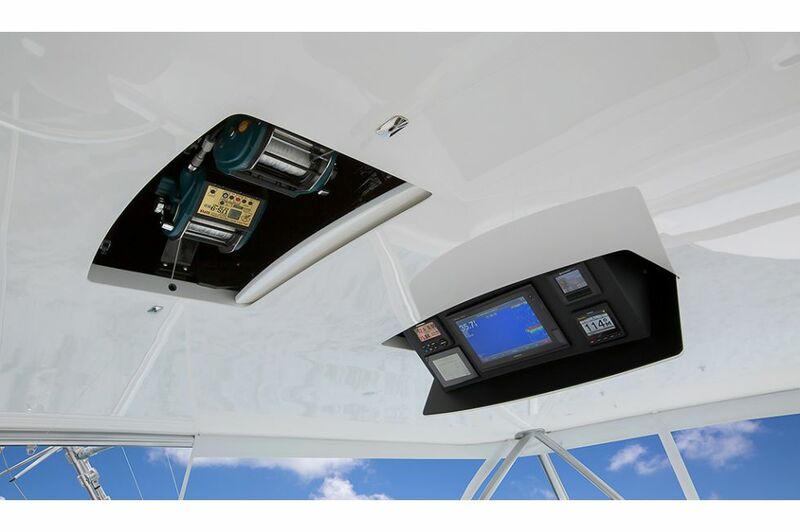 A second station is located on the flying bridge overhang for excellent visibility when docking or fishing. 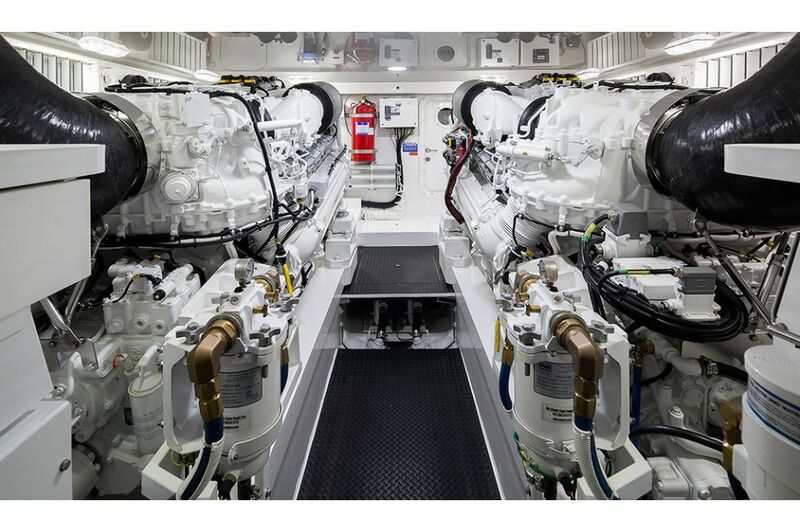 The stand-up engineroom features Viking’s leading edge powder-coated web-frame structural-steel engine beds, which are mounted on dedicated transversals for vibration-free, engine and drive train alignment. 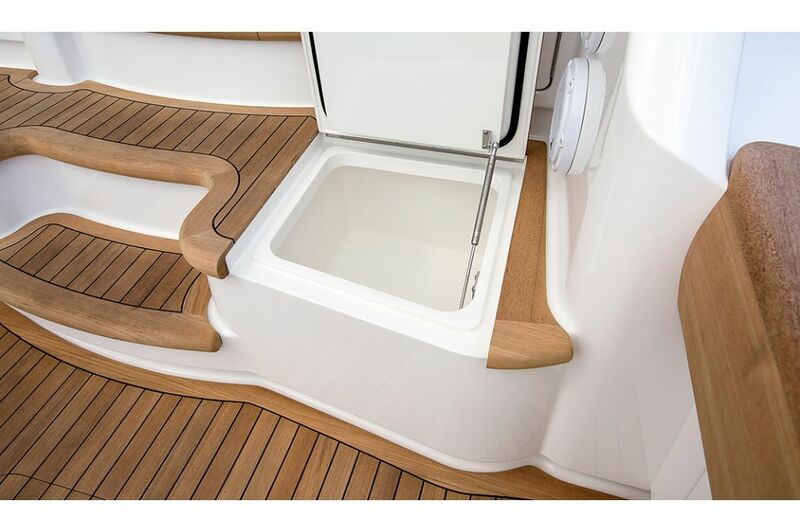 Standard fuel capacity is 2,060 gallons in Viking-made fiberglass fuel tanks, which are nestled in the hull and fiberglassed into place. 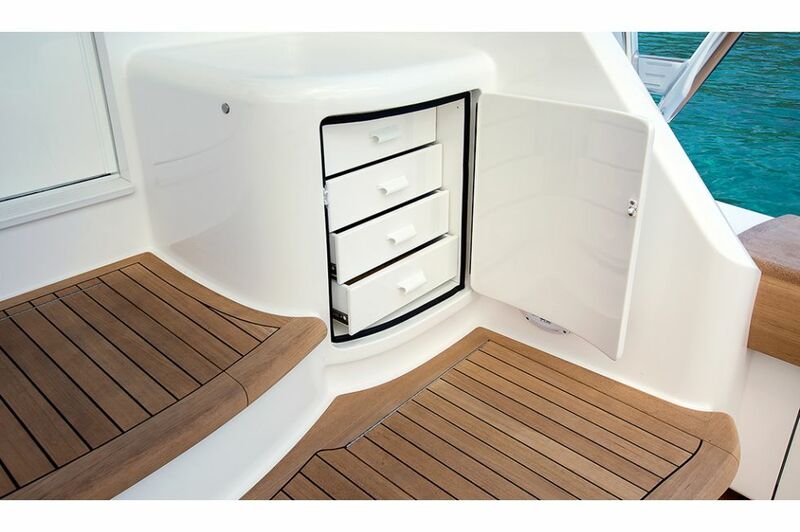 The tanks mirror the hull bottom to maximize draw and range and in so doing also contribute to hull strength. 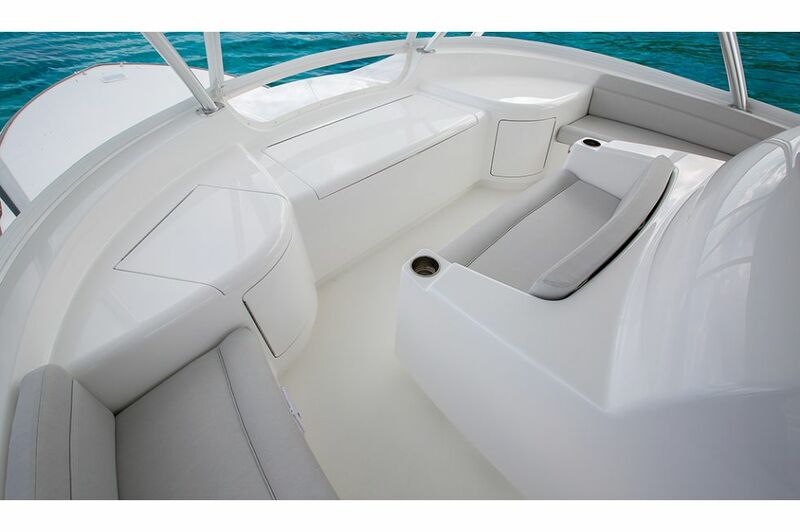 If desired, fuel capacity can be increased to 2,423 gallons. 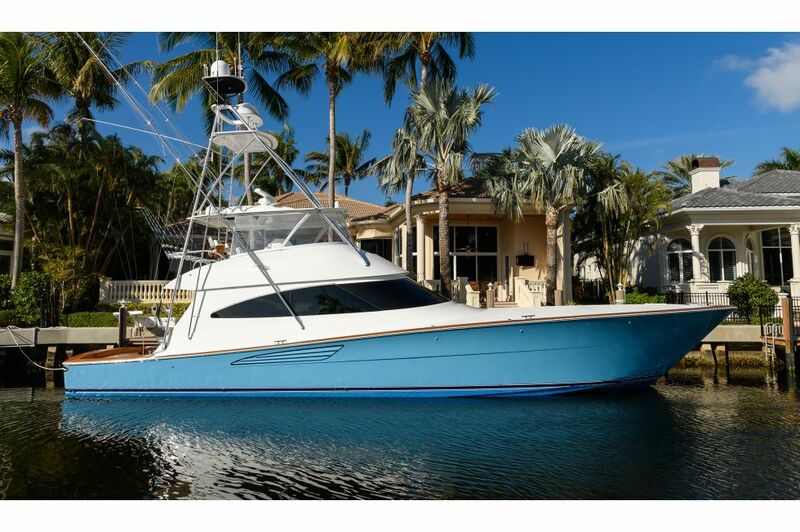 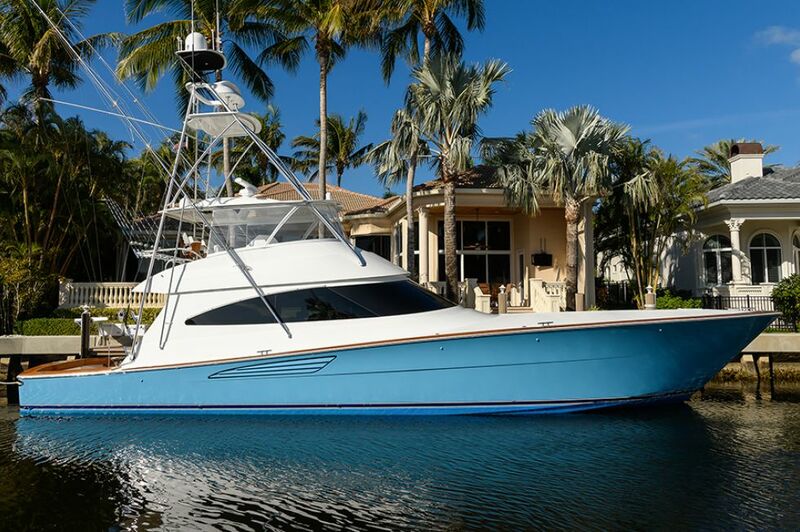 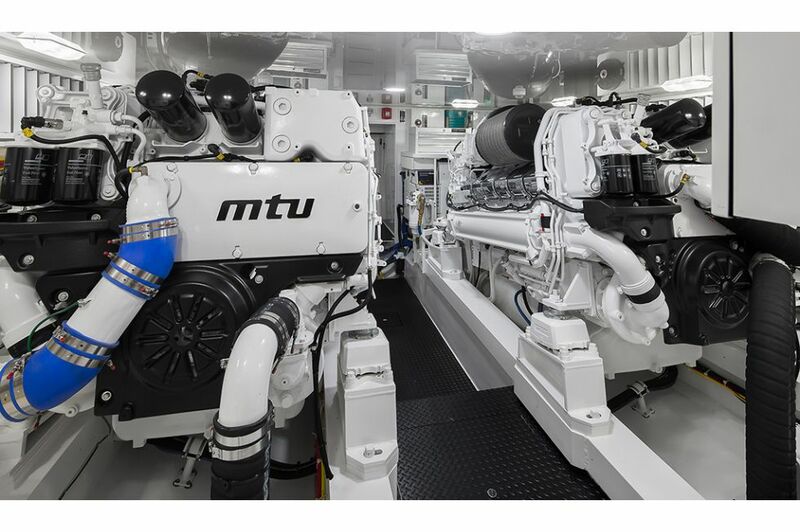 As with all Viking yachts, custom electronic packages and tuna towers can be ordered and professionally installed by our sister companies Atlantic Marine Electronics and Palm Beach Towers respectively for turn-key delivery and utmost satisfaction and performance.